I'm sure native americans are pretty good at making beef jerky, since the history of jerky suggests that they were the ones who invented it. I guess actually, they made something slightly different, but still, the concept of drying and salting beef goes way way back. But this line of jerky from Umpqua Indian Foods has never really excited me. The brand is owned by the Cow Creek Band of Umpqua Indians based in Roseburg, OR. For them, jerky sales helps generate revenue for their reservation. I found their other varieties deficient on taste, both on natural meat flavors and on seasonings and marinade. It does have some taste, just not a lot. 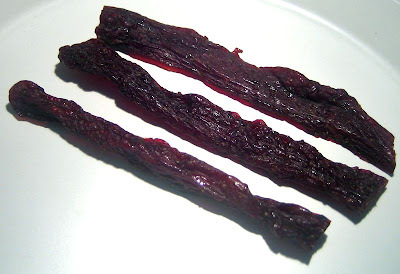 I suspect the true pemmican that indians made long ago might actually taste pretty good, with its mixture of berries and herbs. But today, jerky has to please an Americanized palate. So what we have now is a band of indians trying to make something that cowboys would like to eat. Times sure have changed over the past 100 years. I'm hoping this teriyaki variety from Umpqua Indian Foods will give me a decent taste of teriyaki. Beef, teriyaki sauce, brown sugar, maple sugar cure (salt, cane & maple sugars, dextrose, sodium nitrite), black pepper. The taste I get from the surface of these pieces is a slight sweet flavor. Moving into chewing, I can pick up some natural meat flavors, and salt. I don't find much teriyaki flavor in this. I do pick up very faint resemblances of teriyaki, but it's slight enough that I don't feel it's justified in advertising this as a teriyaki variety. For the most part, I taste the slight sweetness from the surface, and then a saltiness in the meat. That's really it as far as teriyaki is concerned. The saltiness is not too salty, but is definitely a major taste component. I'd say that it's the dominant taste of this jerky. The natural meat flavors are noticeable, but like the other varieties from Umpqua Indian Foods, it's a light taste. The taste itself has a mild smooth meat flavor that's actually quite good. It just needs to be in greater concentration to make this jerky more savory. The black pepper noted in the ingredients is unnoticeable. Overall, it's a good tasting jerky, it just doesn't taste much like teriyaki. It largely relies on salt for its flavoring, with the natural meat flavors coming in second, and the slight sweetness from the surface coming in as the third strongest taste component. These appear to be strips of whole meat, sliced into widths of about 1/2 to 1 inch, and about 4-5 inches in length. It's a dry jerky, being somewhat brittle. Any amount of bending will cause the strip to break apart. That's rather contradictory because Umpqua Indian Foods claims that they use only pectoral meat because it makes their jerky more tender and moist. It's actually the opposite. But being that it's somewhat brittle makes this very easy to break part into bite sized pieces. It's chews rather easily. In fact, once a piece hydrates in my mouth it provides a chewing experience very much like a real steak. The meat is also very lean, I found no pieces of fat, tendon, or gristle. And it's very clean, leaving no residue on my fingers or pieces of seasoning on my lap. I had acquired this jerky from Jerky.com, But they no longer sell it. You can buy it directly from Umpqua Indian Foods from their website, at a price of $5.25 for a four ounce package. That works out to a price of $1.31 per ounce, making this an average priced buy. For general jerky snacking purposes, it presents a decent value. Despite what I've written on its taste, it's still a good tasting jerky even though it doesn't taste much like teriyaki. You'll still get a fair amount of natural meat flavors, and an excellent meat consistency. That seems to give it a good deal of snackability. But as a teriyaki jerky, it's a poor value. If you're looking to spend money to get some good teriyaki beef flavor, you won't find it here. For the most part, this teriyaki variety from Umpqua Indian Foods has a good snackability, which always gets a jerky an average rating from me. Aside from that, it doesn't offer much more to give it a higher rating, and it doesn't live up to its teriyaki advertisement. But it does provide a decent taste of natural meat flavors, but it just doesn't provide enough to satisfy me. 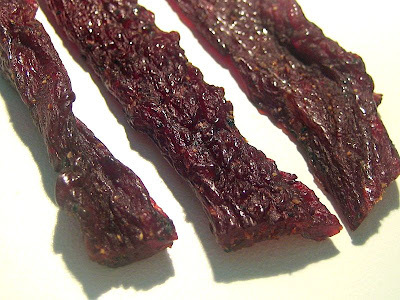 If you consider this jerky has no other flavor except for salt and a bit of sweet, it needs a strong meat flavor to carry it. 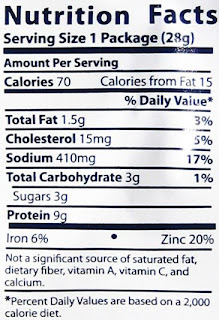 But there really isn't anything strong with this jerky. I still think indians would do a lot better selling something more along the lines of true pemmican, even if it were as bland as this, I think it would market better. My beer recommendation with this is something with a lot of flavor, like a hoppy IPA.